Control of the Pac-12 North race is at stake in the first visit by the Huskies to Autzen Stadium since their stunning 70-21 pummeling of the Ducks two years ago. Oregon run game vs. Washington defensive front. For all the attention on QB Justin Herbert, it's the freshmen trio of RBs Travis Dye, Cyrus Habibi-Likio and C.J. Verdell that make Oregon's offense work. Verdell already had three 100-yard games, while Habibi-Likio is second in the Pac-12 with six rushing touchdowns. Washington's run defense ranks third in the conference and 42nd nationally. Oregon: Herbert. 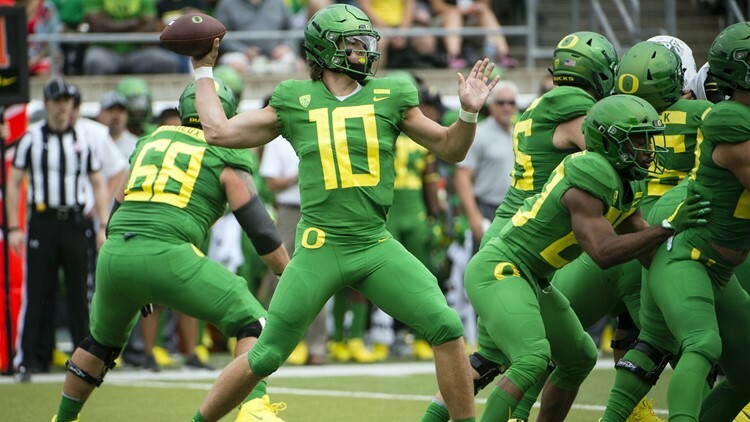 His first college start came against Washington two years ago in a game most Ducks fans would like to forget. Last year, Herbert was injured and did not play against the Huskies in Seattle. Herbert has been tremendous so far this season, especially against Pac-12 foes where he's completing 76 percent of his passes. First time in program history Oregon has faced three consecutive ranked programs while also being ranked. ... Washington LB Ben Burr-Kirven is third in the nation in total tackles, forced fumbles and fumble recoveries. ... Oregon has lost its last two games against top-10 teams at home. Had won previous six. ... Washington WR Aaron Fuller has at least 100 yards receiving in four of six games.